Austria is expecting excellent wines from the 2018 vintage based on how kind the weather gods were and how well the producers managed inherent challenges. hectoliters, with once again, the expectation of wines of very good to excellent quality, notes a news release from the Austrian Wine Marketing Board. Fortunately, the weather gods smiled, giving the growers a respite with a mild and sunny summer that continued for most of the rest of September and October and the harvest could proceed in good order. Considering the temperatures and the September rains, some winegrowers chose to start picking very early, while other producers continued to wait for the grapes to ripen, and preferred to harvest their vineyards later. In both cases, however, in spots where botrytis had appeared early, meticulous selection was necessary, which led to significant losses of volume in many Riesling vineyards in Niederösterreich (Lower Austria). weather during the vegetation cycle. 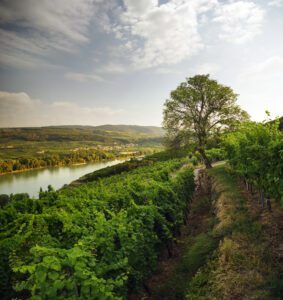 Learning from the experience of recent particularly hot years, Austria’s top winegrowers were able to hold off the dreaded sunburn and resulting tannin overload through meticulous vineyard work. The acid values, generally speaking, are slightly lower than in 2017, although not readily perceptible to sensory examination in Grüner Veltliner or the Rieslings. Without a doubt, there will be certain bottlings of these varieties that match the demanding standard of the previous vintage and leave nothing to be desired in terms of varietal typicity and aromatic expression. The aromatic varieties such as Sauvignon Blanc and Gelber Muskateller turned out to be typically expressive, but due to abundant rainfall in the Steiermark seem slightly lighter than last year, thus representing a certain exception to the rule. The wines of the Pinot family are quite lovely, showing significant harmony and early balance. The “exotics” in the landscape of Austrian wines exhibit good breeding as well, with varieties like Roter Veltliner enjoying a certain degree of immunity to overbearing sunlight because of their dark pigmentation; one hears similarly positive things about the Thermenregion’s specialities Zierfandler and Rotgipfler. impressive 2016s among premium reds – it is possible to look forward for the first time to a quartet of extremely promising vintages. Regarding the dessert wines, this optimism may be a little premature, although it seems that substantial Beerenauslese, Ausbruch and Trockenbeerenauslese are being vinified in the noble sweet sector, along with racy Eiswein.